Guitar picks never last very long. If you don’t lose them, eventually they just break under the sheer force of your ability to rock as hard as anyone has ever rocked. 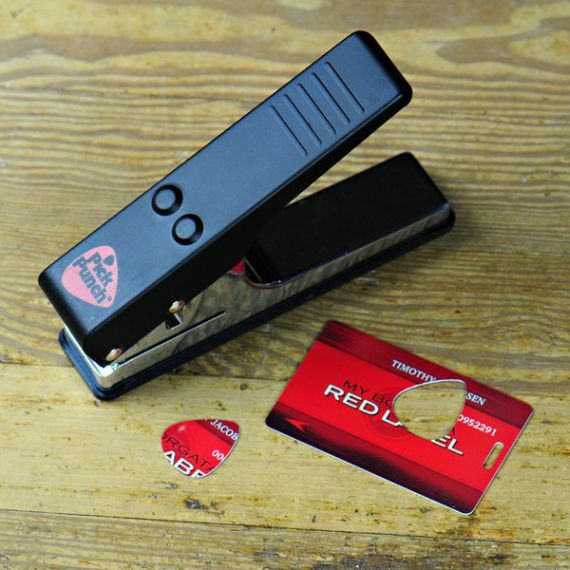 Sure, picks aren’t very expensive, so you could just keep buying replacements as you lose or break your picks, but if you pick up the Guitar Pick Punch instead you’ll never have to buy another pick again. Guitar Fella reported to us about this awesome tool.Whenever you need a pick, just find something made out of thin plastic, and stick it in the Pick Punch. You can make guitar picks out of old credit cards, thick clothing tags, or your brother’s library card (books don’t rock) – the choice is yours! For the cost of this pic punch you could buy a lifetime of high quality pics made from performance materials (credit card plastic is not a suitable material and will hold back the pro and beginner alike). Don’t think the right materials matter? The cheap plastic that credit cards are made from will wear away over time, whereas a real pic should give years of dependable use. Having a pic that wearing down quickly is bad enough because the player has to keep adjusting how they hold it, but it also has the tendency to make the edge-width wear down and become thinner over time (thin edge vs thick edge can make a huge difference in sound and feel) You don’t want a pic that changes shape and edge thickness over time. You want it to be consistent and dependable. It’s a novelty item, you douche! It’s a valid criticism, you enema!